Craftsman Hisanori Masuda's casting studio, Chushin-kobo (Literal Translation: Iron Heart), aspires to design ironwork which integrates the beauty of traditional Japanese casting with modern day functionality. Hisanori Masuda was born in 1949 in Shizuoka Prefecture, Japan. After graduating from Musashino University of Art (Fine Arts and Design) where he studied under Prof. Mosuke Yoshitake, Hisanori stayed on as a studio assistant to his professor for 5 years. During this time, Hisanori was successful in revitalizing local industries through product design. Later he moved to Yamagata City and established his own studio, "Chushin-Kobo" in 1997. He seeks to recreate objects retaining the beauty of traditional Japanese cast iron but stylishly adapted to fit contemporary life-style. Using iron, aluminum and bronze, he designs, produces and sells all his own work. He is currently a member of Japan Craft Design Association and teaches at Tohoku University of Art and Design. Traditional craft design is not conservative. It is innovative, encompassing both the hardware and software of its era. For traditional crafts to be passed on to future generations, artisans must undertake to design practical, refined and modern items. Cast iron eliminates chlorine from tap water, so the boiled water will be mild, have no smell and will be tasty even just as hot water. The water in turn will have iron, which is a merit to be able to take iron naturally as we need it for our body. So you can enjoy tasty hot tea with a hint of healthy iron. The iron of hot water and tannin of tea react together to make and enjoyable tasty tea. Our selection includes cast iron tea pots with both rough and polished tops. 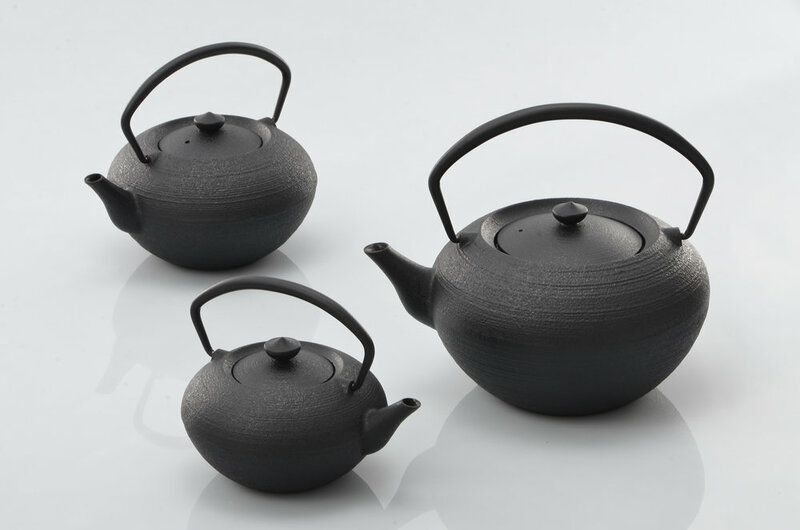 The “Hiratsubo” style is a very classic style tea pot. Well made and strong, a tried and proven design that dates back from long ago. Hiratsubo is popular with its stable design. If you are looking for modern and elegant teapot, this teapot will satisfy you with its traditional beauty. 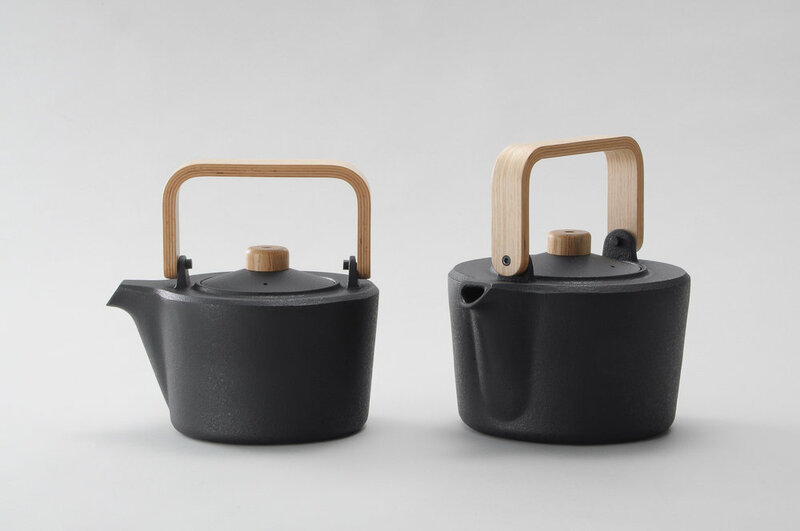 The Wood Handle Kettle” comes with a handle made of molded plywood. The materials of iron and wood suit each other very well. The folded plywood handles are very strong, durable and functional. On the kettles lid, the wooden knob is designed for ease of use and you can choose either white oak or a walnut one. The casting kettles` inside has a burnt finish of lacquer; the iron kettle has a finishing of bisque. The bottom of the kettle is a flat design and can be used on either an electric cooker or an electric range stove. The modern designed kettle which is made with a traditional technique that is suited for a modern lifestyle. Another model is from the “Crest“ collection. These iron kettles are designed with a motif of an exquisitely designed crest from long ago. From ancient times, the scholar and military senior statesmen gave a character or a god pring, and they made it into a house crest, a banner and a horse seal. The crests originationg from these coat of arms are now as many as 4,650 types. Chushin Kobo used 4 types for the shape of the iron kettle that include Quince Type and a gourd shaped crest. The handle is a bow-shaped design that matches the shape of the main body, the copper lid knob is a combination of a chrysanthemum. A pine tree, a chrysanthemum split, and a gourd that harmonize with the shape of the main body. The finish is uncalcined at 800 degrees, an oxide film is applied then hand painted with a baked finish of urushi lacquer which is done by using a traditional technique from long ago. The “Warmer”, of course, has the function of keeping warm, but the light of the candle illuminates the table and enhances the atmosphere. Setting the Iron kettle on a warmer, you can enjoy tea time with a feeling of relaxation. 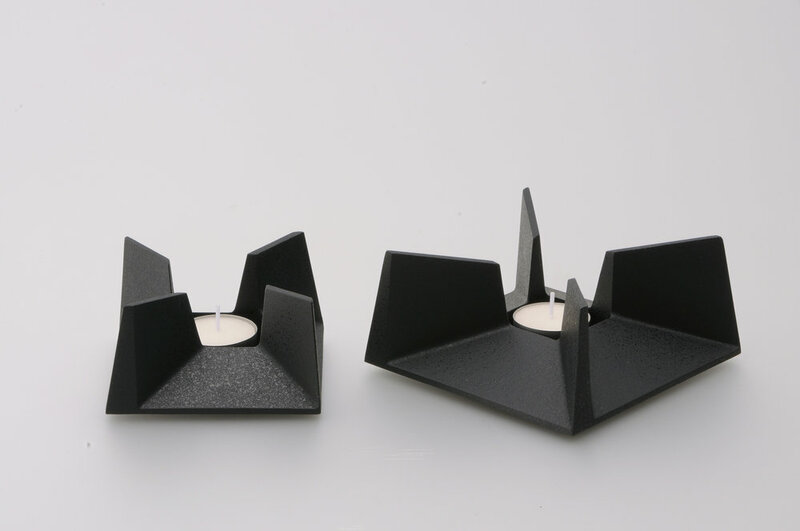 Warmers are a tool to be used every day in Europe and America, but there are still few things used in Japanese homes yet. Please use it to make a relaxing atmosphere around the table. The warmer is not a tool to boil water, it is a tool to keep water warm. All the teapots keep the temperature of hot water. Therefore, you can extract the taste and aroma of tea leaves carefully. In addition to this, the teapot can keep the temperature of the tea for a long time. Enjoy a chat without caring about time! These cast iron teapots will last for many generations with care. Please dry after use to ensure that it is kept in a good condition. We have many other models that can be ordered from the catalogues when you visit our store.